Get total access to our premium eBooks with Resell Rights, Master Resell Rights and Private Label Rights. We strive to bring our members the very best products with exceptional customer support. We've been in business for almost 10 years for a reason. No commitment or automatic billing. 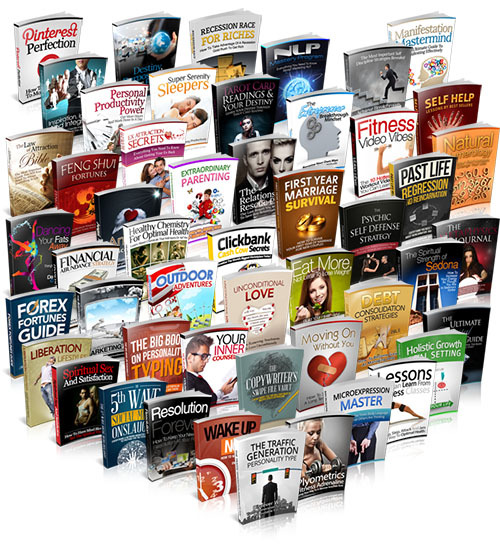 Get a 1 year membership, and start downloading Premium eBooks today for only $39.99. Please remember that there is no commitment or automatic billing. This is a one time payment. Your satisfaction is guranteed! Put your name on the products as the author – This is the most obvious benefit of them all. Private Label Rights allow you to claim authorship to the eBook and you can use it to build your name/brand or sell it. Edit the contents – You can change the titles, edit the product contents, insert your affiliate links, and/or paste your own advertisements into the products. These are just some ways to monetize in addition to the profits you are making from selling the eBook. You can take the content in the book and arrange them into your very own articles. On the other hand, you can also take a few PLR eBooks and combine them together to create one HUGE mega eBook and sell them for profits. You can shorten the eBook by taking out the key points and turn it into a special report that you can use either as a teaser to get people to buy your eBook or you can use it to capture leads. Depending on the terms and conditions, you can use the eBook to give it away as a bonus to products you are already selling. You can also offer additional rights to your eBook that will enhance the perceive value (e.g. basic resell rights, master resell rights or even rebranding rights). Sell the eBooks in different market places, like eBay, Amazon, etc.. This is recommended after editing the content and title of the eBook. Please follow each market place's policy & guidelines. These are just some examples that you can use to monetize eBooks. It really is up to your imagination to come up with additional ideas how to market yourself with PLR eBooks.